This classic Malaysian dessert, Bubur Cha Cha is always a hit in our gatherings. The aroma of pandan leaves and coconut cream will get you hooked. I like putting all kinds of sweet potatoes, together with black-eyed beans. 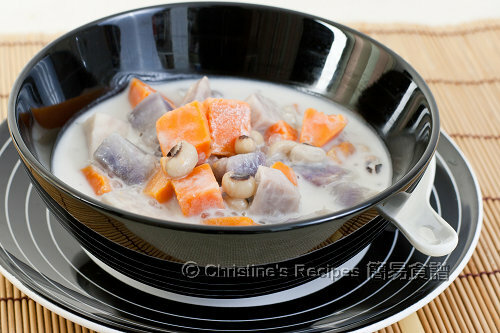 The translucent tapioca pearls add an interesting texture in the coconut soup. This dessert can be served as hot or cold. What I like the most about this traditional Malaysian dessert is its colourful presentation. 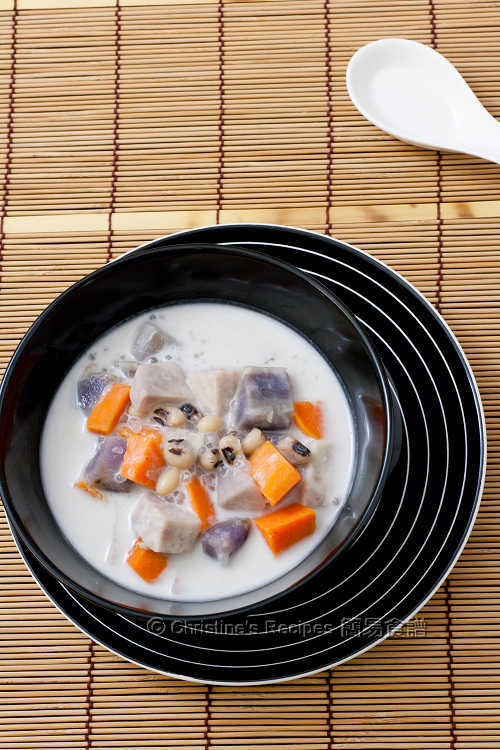 Needless to mention that its taste is wonderfully good because it’s made with fragrant sweet coconut soup, delicious sweet potatoes and tapioca pearls (sago pearls). This dessert is so popular around the world and many new variations have been created. Some Malaysians like to add bananas and black-eyed beans into this dessert as well. It can be served hot or cold. I prefer to enjoy when it’s still warm. I'm so glad you posted this recipe. A restaurant near my college used to serve this as a special treat on Saturdays and I always loved it. Thank you! Christine, I really want to purchase your cookbook. Is there anyway you can sell your book at ebay or amazon.com? ET's website is written in Chinese and the currency is also another issue for me. In chinese, we call it "mo mo cha cha" （摩摩喳喳). Sorry, not on amazon or ebay yet. Here's the english online order page of my publisher. They put up demo with english instructions as well. Hope it helps. Aaah...yes....this is our Malaysian favourite dessert! Some will drizzle some palm sugar on top to give it different taste and aroma sweetness. Well done Christine. I love bubur cha cha. I'd put all of your ingredients plus banana for a bit of tang. Though the price seems to be higher I believe. Just received your book from Yesasia.com (in 2weeks)they also accept Paypal, don't be afraid to order from them, it was my first time and it was a smooth transaction. Christine,Your book is Fabulous! Lots of Favourites, just like home cooking and Dim Sum. Have to cut down on eating and start sharing.Can't wait for your next book! Do you have a recipe for Steamed Chicken/vegetable Buns with the quail egg? Oh, their delivery was so speedy. Thanks for your feedback and kind words. Just got a recipe of steamed pork buns on this blog. Please click to see if you like it. You might like to watch my video of how to wrap a chinese bun as well. Christine, sorry to ask you, are you sure we have to soak the sago for 10 minutes. Drain and transfer into a pot of boiling water ? 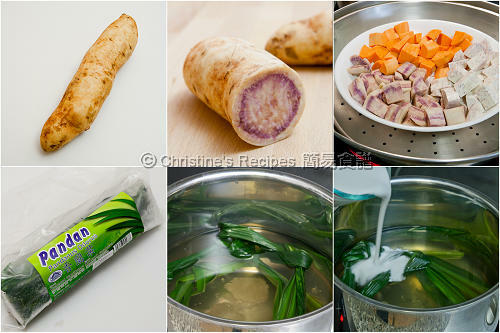 I have not try your recipe as I wanted to cook it on the 15th day of CNY. I did soak my sago, it became a bowl of white sago powder water and can't find any sago in it any more. My friend laughed at me and she said we MUST boil them for a few mins then soak them in boiling hot water not cold water. Boil for 5 mins or depends on the size -- big or the tinny one. After that my sago came out as pearl by stand in the hot water after boiled for a few mins. If big one, stand then stir and boil again for 2-3 mins, cover and stand for 20 mins and check and repeat until no more white spot in the center. Would it be the different results made from different brands of sago? Mine wouldn't become powder after soaking, just a bit of starch came out from the surface. See the pictures on the post. That's exactly what I did and what I got. 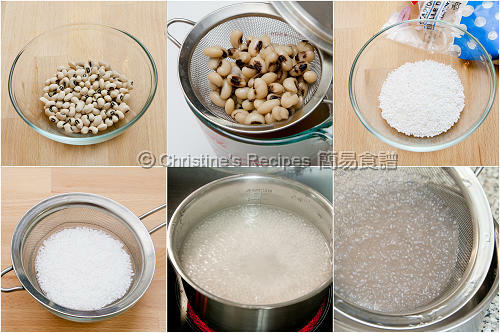 Feel free to adapt the method of cooking sago according to the packet instructions or your experience. The main purpose is to get the sago cooked through. There's no right or wrong ways, only suitable ways. May I know if this prepared dessert would taste sweet or salty? Thanks for reply. It tastes sweet. You need to add rock sugar or coconut sugar. which brand of coconut milk is best to used? I used Kara UHT coconut milk. You can use any brand that comes in handy to you or your favourite one.